Today I want to share with you a few of my favorite Etsy purchases. 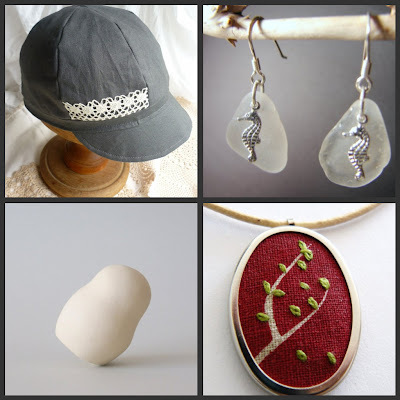 Clockwise from top left, Cute EcoVintage Cap in Grey Linen by Sandrine Marsh, White Sea Glass and Sterling Silver Seahorse Earrings by Sea Glass Designs, Little Leaves Embroidered Pendant Necklace by Edward and Lilly and Balance - Mini Art Feeling by Art Mind. Not only are the creators of these beautiful items super talented, but they are also super nice! Pictured above are recent giveaway prizes that I won last month. I am not one to enter a lot of giveaways so you can imagine how surprised I was when I discovered that I was the lucky winner! 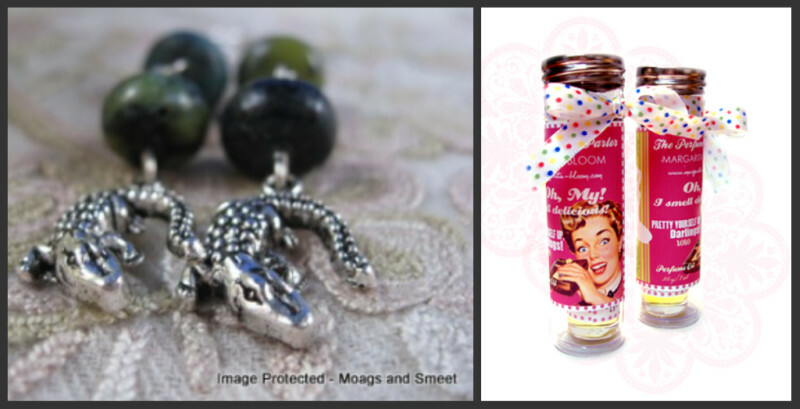 The cool Crocodile Rockin' - Turquoise Earrings which I absolutely love are by Moags and Smeet. The heavenly smelling roll-on perfumes are by Margarita Bloom. I also have to add that both prizes were packaged so nicely. They were as much of a treat to open as they were to receive! 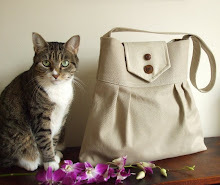 Shop Update: Next week I'll be adding new Harris Tweed messengers to the Pesky Cat Designs shop. There will be slight difference in their design. I will also be introducing some items made with two new textiles that I am very excited about. So stay tuned! How sweet is the cap from Sandrine? 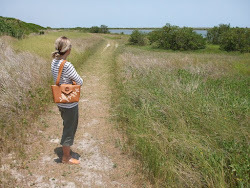 Perfect for stylish Floridian beach walks no doubt. Elisa, this hat is to die for and so are those crocodile earrings!!! What cute little gift ideas. How is your little baby? I am home sick in bed. My two are snuggled up next to me. After being gone they now have me home in bed with them. You have such good taste, Elisa, those items are gorgeous! So glad you liked your prize! You are having us very excited to see your new design hot from the studio! those sea horse earrings are amazing. i love those sea glass earrings... very original and creative!!! This is so sweet of you... 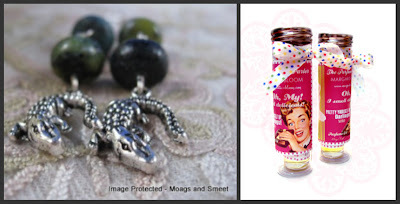 I *love* those seahorse and croc earrings, too. And how cool regarding the contests! Yay, for fellow kind artistes! Thanks so much for the mention. If I don't get back over to your little space before Christmas I hope you have a really lovely festive season. Had to say goodbye to my sweet Anni this past Tuesday. She had been sick for several weeks and after my Vet confirmed that she would not get better only worse, I decided I could not let her suffer. So at around 2 pm she traveled to the rainbow bridge. She had been my buddy for more than 15 years. When I first started sewing she would often sit right next to the sewing machine occasionally swatting at the lose thread at the end of my fabric. My partner walked by one day and said " Are you being a pesky little cat Anni?" That stayed in my mind so when it was time to name the shop, "Pesky Cat Designs" seemed perfect. She was actually far from pesky, with such a sweet and gentle demeanor. I will never forget my little sweetie. She will be in my heart forever. The Pesky Cat Designs shop has reopened! My work pictured on the left has taken time away from my work on the right. Spending free time these days with friends and walks on the beach. Wishing You a Joyous Christmas! 100 Bags - I Did It! Anni the sweetie who inspired the name of my shop. Click here to give the value of 0.6 bowls of food to rescued animals. No donation/money is required.